At the show, I expanded my budget a little bit. I put a little cash aside each month just for this show, which was thankfully easier due to paying off my car and credit cards a while back. That allowed me to spend more time in boxes that weren’t $1 or less, and expand my reach into more game used things. I actively sought those bins that had relics in them, when I couldn’t two years prior. I know that some collectors aren’t into this stuff, or think they’re completely played out, but I still enjoy them if they’re designed well. 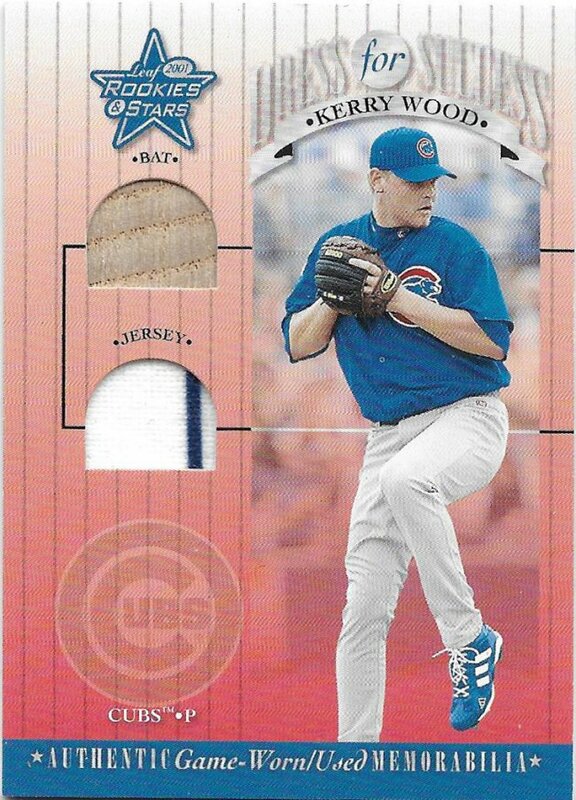 I’m also kind of liking the over saturation of game/event-used/player worn/probably all fake jersey and bat cards, because it means the prices are lower for a lot of them. Stuff that was a case hit back in the day is given the same consideration as a 3-hit per box type card. My wallet likes that, and I took full advantage. Here’s just a very small sampling. 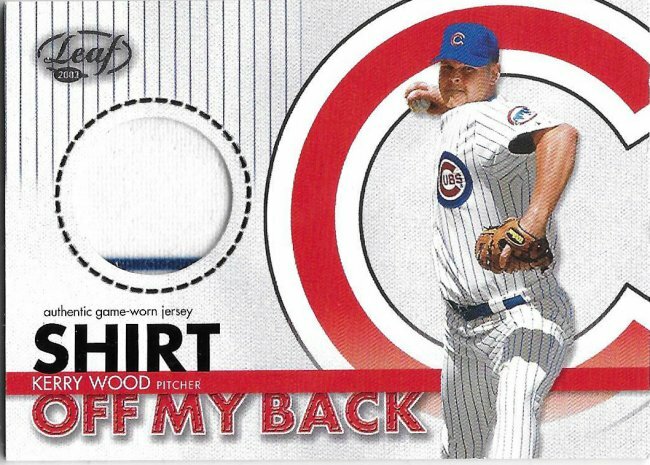 For Kerry Wood, I found 5 relics I needed, including 1 that’s also autographed. For this set, I still need a Prime Cuts and an autographed version of the Dress for Success, plus some other stuff. That horizontal stripe clashes with the vertical design. I don’t know when the jersey became more of a mainstream, every box thing, but this is 2003 Leaf and I think the only relic type in the product. This is #/500 which means it was still rare overall for those boxes. I think. For Greg Maddux I upped my game to 17 relics. Not too shabby. That also led to finding some relic parallels. For instance, here’s the bronze version of the above, which is out of 150. 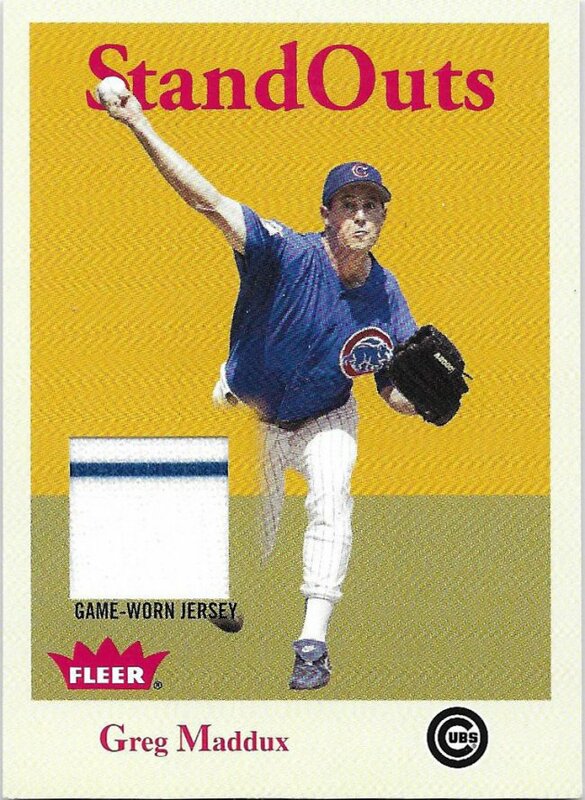 There are also other rarer versions, and also a home jersey picture of all of them to chase. Hope I remember that, because I tend to remember the look of cards when hunting but not these details. You know what would have made this stand out is if the pin stripe were just a little lower and matched the horizon line. You know what makes this stand out is the mostly missing leg. 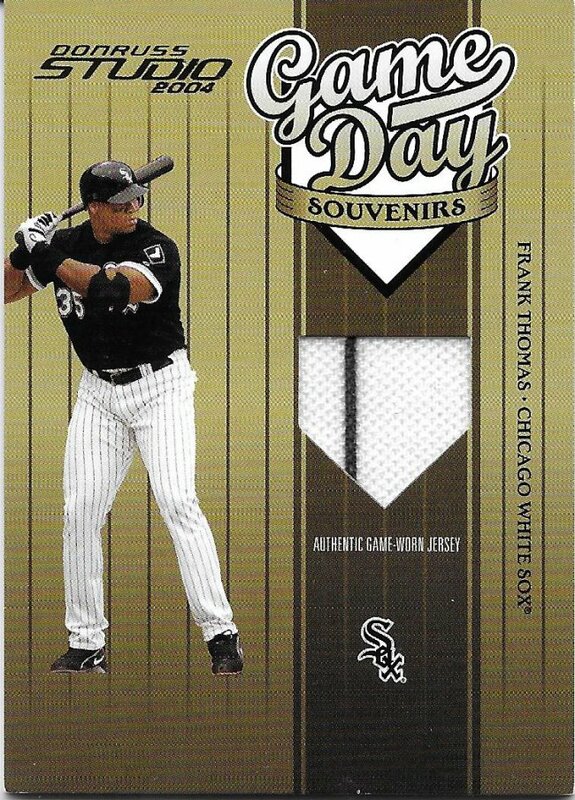 I wasn’t as lucky with Frank Thomas. His cards tend to be more expensive. I found 9 relics I needed of him, including this one which looks better in person with the red foil. What a weird picture scaling choice. He looks so tiny. 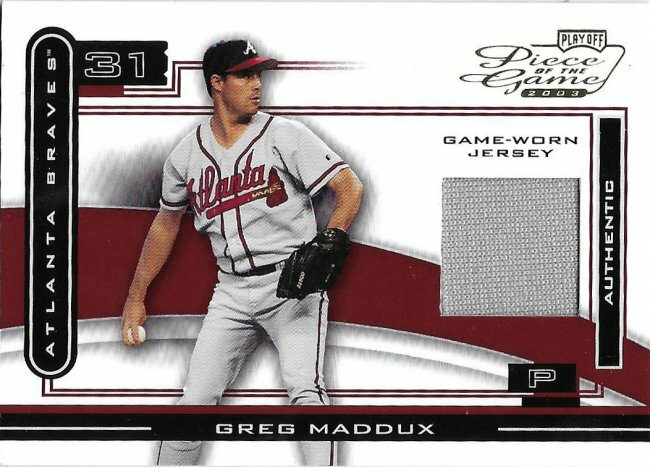 That pinstripe is SO CLOSE to matching the card, too…. 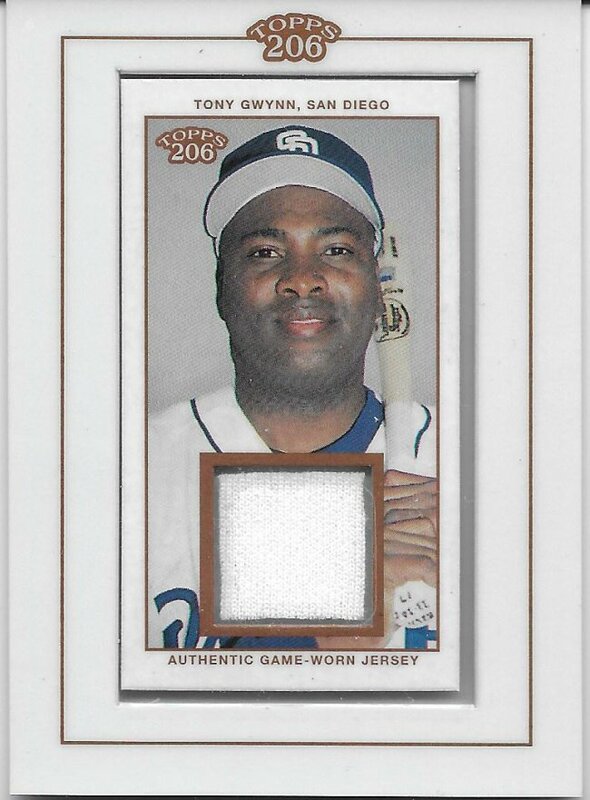 Lastly, Tony Gwynn netted 16 new relics. Maybe I shouldn’t say lastly, because I got a good amount of the 2016 Cubs players, too. They’re just not featured today. …this is the pink frame. They’re much more obvious in person. 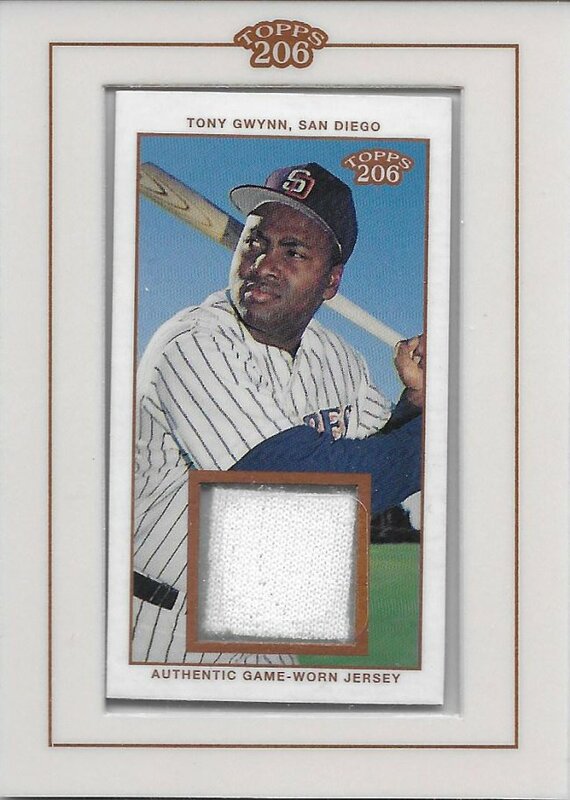 I’m not too familiar, but I believe there were three different series of 206 that year, and all three had a different Gwynn relic. I still need the yellow frame one. Maybe at the next National, I’ll find it. By the way, the expanded budget meant I also bought a few autographs, but that’s for another post.